If there’s one thing I look forward to every now and then it’s a little self indulgence. Since I’ve stopped taking my Lumity my skin has felt terrible. I’ve had breakouts and the dark circles under my eyes have been alot more prominent making me look as tired as I feel! Emma had the perfect treatment to target my under eye area. 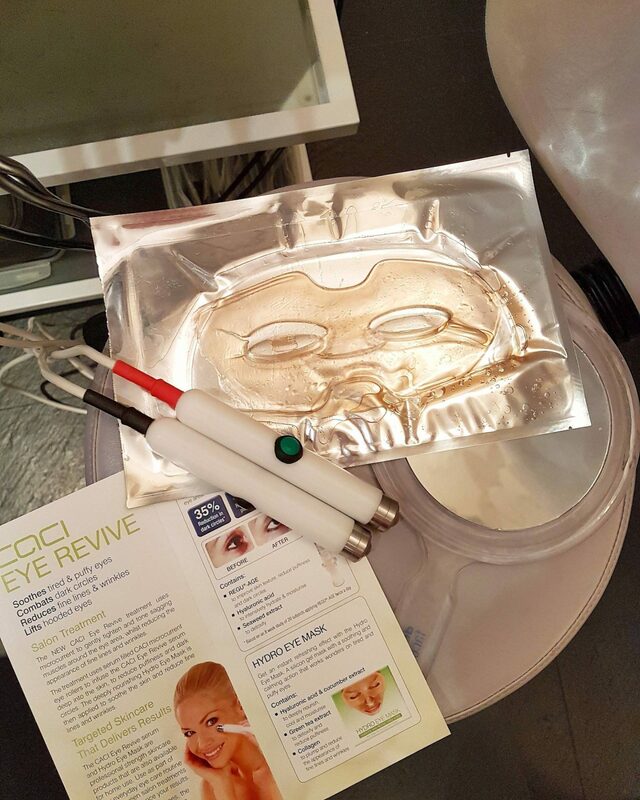 The Caci Eye Revive. I’ve heard about CACI before but this is the first time I have tried it. Facial technology is constantly evolving and there are a large amount of ‘in Vogue’ treatments around but CACI is one that’s been around for as long as I can remember. CACI uses a micro-current technology which was originally developed to treat bells paulsey sufferers to re-train the facial muscles to lift and tone. CACI is a perfect treatment for people who are concerned about the ageing process but want to avoid invasive surgical procedures and maintain a natural look. It’s been nicknamed the non-surgical facelift. I did experience a slight tingling sensation every now and then as the muscles were contracted but that’s all perfectly normal. I found it really relaxing much like a normal facial but with electrical probes. I had the CACI Eye Revive Treatment focusing on my dark circles and fine lines but you can have it done on the entire face. The best part of my treatment was when Emma applied the serum covered silicone eye mask. This was so cooling and my eyes felt wide awake after and she popped it back into it’s pouch and I got to take it home and put it in the fridge to use again. Following on from this treatment Emma then tailored a Dermalogica facial to my needs where I had a full cleanse and exfoliation and as I was suffering from breakouts I had a steam treatment. On to the ‘multi-masking’. My chin area was experiencing breakouts so I had a charcoal mask to draw out the impurities whilst the rest of my face was lacking in hydration so Emma applied a multi-vit mask.